I was so accustomed to overcast conditions that I almost disbelieved the beautiful sunny morning. 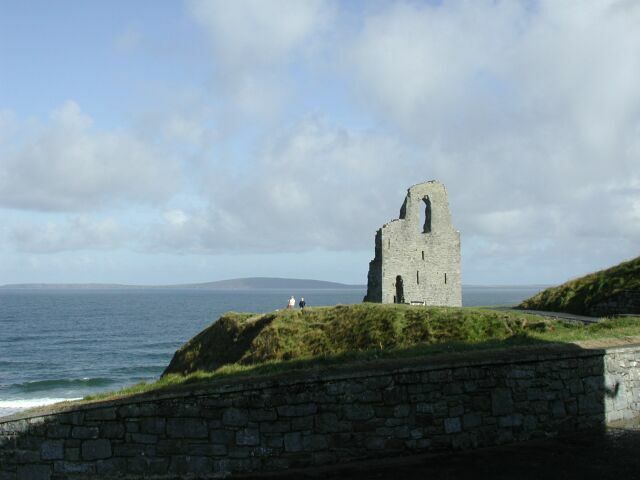 The scene along the coast in front of our hotel was a gorgeous panorama – the ruined castle, the cliffs, and the beaches below. Before leaving we took a walk along the cliffs, and retook some of the pictures that we had taken in the dreary afternoon of arrival the day before. In the freshness of the early morning sun the town had lost its honky-tonk atmosphere as we biked down the main street. I waved goodbye to Bill Clinton, who was still poised on the backswing of his driver, and momentarily regretted never having seen the golf course that must have been around there somewhere. But we couldn’t tarry, because this was our longest day. 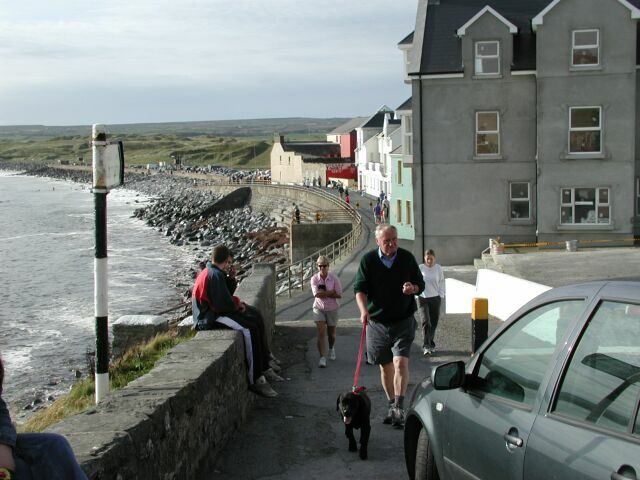 Originally we had intended to spend that night in Milltown-Malbay, but since we were unable to get a hotel reservation there, we had moved the destination another seven miles to the north at Lahinch. 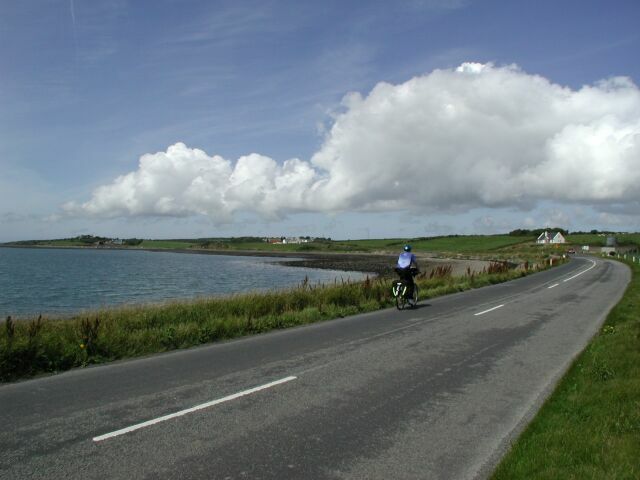 In order to bike to the north it would necessary to cross the wide Shannon River, which meant taking a ferry from Tarbert. Unfortunately, Tarbert was located inland about 14 miles, so we would have to bike a considerable distance out of our way to go inland to the ferry and then back to the shore. Not only did this add a lot of miles, but also the detour was through relatively uninteresting territory -- there was hardly even a town to break the monotony. There was nothing for us to do but to put our heads down and push the pedals. 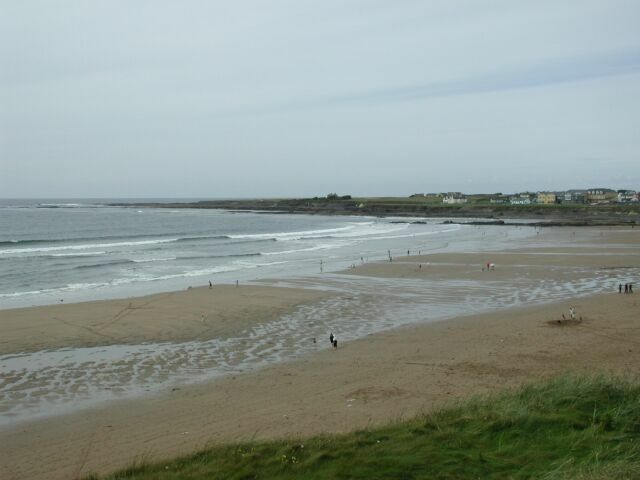 Once again the way out of Ballybunnion started with a long hill. This one climbed up 250 feet. After that it continued to be hilly, although not as bad as the first hill. As we neared Tarbert we were doing time checks, since the ferry sailed on the half hour. It became apparent that we were going to miss the ferry by only a few minutes, which would mean waiting a whole hour for the next sailing. Len suggested that we step up our pace and try to make the 11:30am ferry. It was about 11:25am then, and the ferry was another three miles or so away. I didn’t see any way we could make it, but Len said maybe the ferry would be late, and the next thing I knew he was speeding ahead in overdrive. I didn’t seem to have overdrive myself, and I watched him disappearing up ahead. There was a slow moving maintenance truck in front of us, and Len was passing the truck. I was thinking that he couldn’t do that. I couldn’t remember ever passing a moving vehicle on my bike before – even if it was a slow truck. Nevertheless, I followed his example and puffed my way around the truck, giving me some very small sense of accomplishment. Len was now out of sight, and I imagined that he would make the ferry, and I would find an empty dock when I got there. However, I finally rounded the last bend, and there was the ferry, still docked. 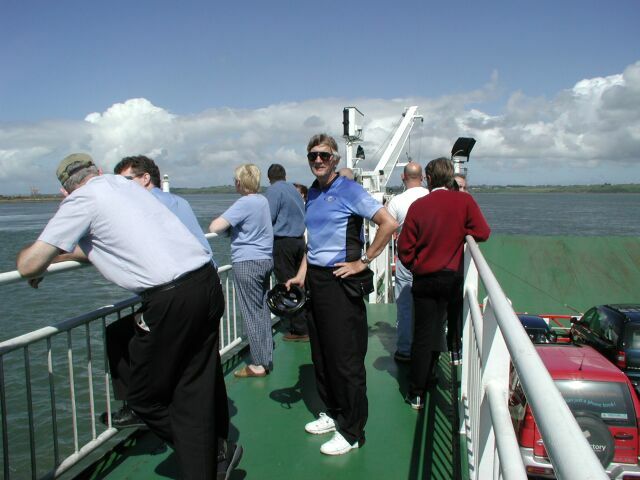 Len was standing at the stern next to the ferry conductor. As I pulled onto the ferry, I had the idea that he had held the ferry for me, but a few more cars followed, and I was disabused of that notion. I think they simply waited until the ferry filled up before sailing. 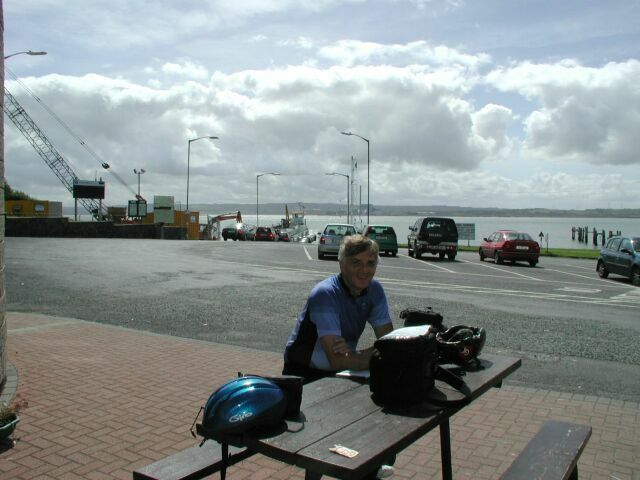 Moreover, Len now informed me that he had discovered that the ferry sailed twice an hour, so there had been no need for the desperation we had just shown. I parked my bike and walked up the stairs to the top deck, expecting to enjoy the rest and the scenery. However, to be honest it was a bit windy and cold, and the view wasn’t that great. At least there weren’t any hills! It was only about a fifteen-minute trip, and we spent most of that time trying to pay the ferry toll. We found the cramped little office on the lower deck where someone was sitting at a desk, and asked about the fare. The man seemed a little surprised, but accepted $2.50 from each of us. It must have been the honor system for bikes, and maybe they didn’t expect us to pay at all. Nevertheless, I felt better for having done my duty. I had been hoping for a coffee break, but there had been no time. As we approached the north shore a snack shop came into view, and that seemed like just the thing. As we were laboriously locking our bikes together (it took two tries) we encountered two Germans on bikes leaving the rest stop. They said they were headed south. “Into the wind,” remarked one of them tonelessly. I couldn’t tell whether he was bragging or complaining. Going through the little cafeteria line, the coffee break turned into lunch. I got a ham sandwich and a coke, and we enjoyed the sun at an outdoor table. While we ate, we debated the route to take to the north. Unfortunately, this was one of those missing map segments, and it was a critical one. We could bike directly north on a secondary road, or we could bike west to the town of Kilrush and then head northeast on a main road. The route on the main road was about five or six miles longer, but it followed the river for the first half of the distance, and I believed this would be flat. Furthermore, our experience of secondary roads was that they were hilly and slow going. Still, it was an extra half dozen miles. I longed for the proper map that would have told me about the hills, but in the end we chose the longer main road. I’ll never know about that secondary road that we didn’t take, but I now know that the main road was really hilly. On the trip I got fooled time and again about roads that followed rivers. I had this unshakeable belief that they had to be flat, but they never were. The problem was that these roads never went along the riverbank, like it appears in this photo, but instead climbed up and down the valleys that the rivers inhabited. As I puffed along the ensuing hills, I thought about the physics and psychology of climbing on bikes. In a vacuum and without friction you would be able to coast up every hill perfectly from the momentum gained on the precursor downhill run. However, reality doesn’t even approximate that behavior. The wind resistance, which is nonlinear with speed, saps your momentum almost as soon as you start the uphill. Of course, friction doesn’t help either. 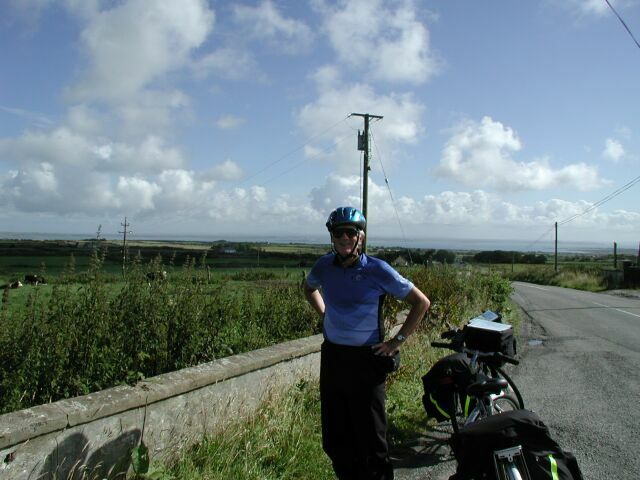 In my memory of the trip I remember the uphill climbs, and I have almost no memory of the downhill coasts. Except for the long downhill run from the pass on the way to Killarney, all the other downhill runs went by in a flash and were quickly forgotten. Maybe in some sense the uphill climbs gave me a chance to appreciate the surroundings and to stretch out my sense of time. It seemed like on every hill I would bike up towards a bend, which I always imagined would be the top of the hill. I would think that all I had to do was to make that next bend. But once there I would see the hill stretching upwards towards another bend, which I would now concentrate upon with the belief that this would be the end. And so forth. 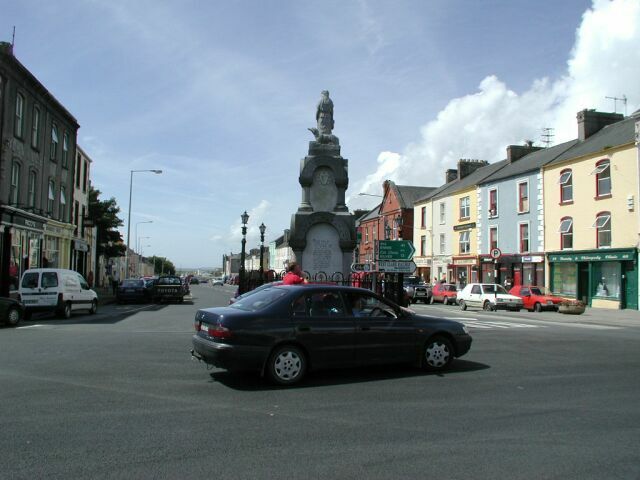 Kilrush was a pleasant surprise that made up for the hills. It had an interesting town square where a number of roads came together, and a main street that seemed to run directly down into the river. It also appeared to be more of a real town than the places we had been staying the last few days. Getting out of Kilrush was a little confusing with the conjunction of roads and the lack of a good map, but Len did his usual thing of asking several pedestrians, and we were soon on our way up a long hill out of town to the north. After a while I gave up pedaling and started walking my bike for the first time in several days. But I finally realized that it was just as easy to pedal as to walk the bike. The problem was catching my breath, not pushing the pedals, so with periodic rests I could resume biking. 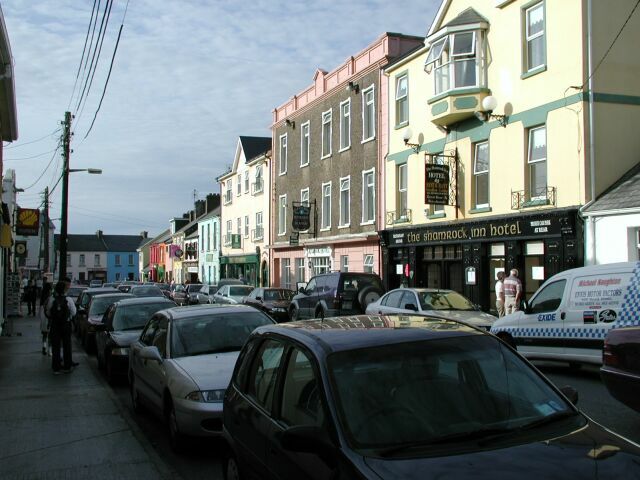 About nine miles out of Kilrush we stopped at a little market store in the tiny town of Creegh to enjoy an ice cream cone and a drink at an outdoor table, and after another ten miles we finally regained the west coast after the long inland detour. 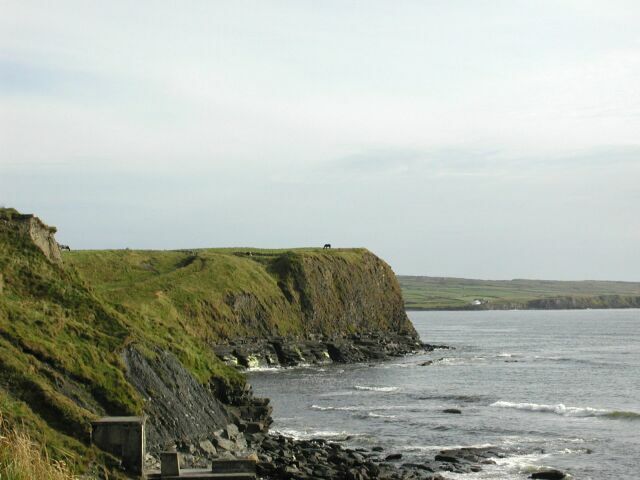 From here to our destination of Lahinch, the route followed the shoreline, rising up and down small cliffs. We passed several golf courses and resort hotels, and pretty vistas like this one where a lonely horse grazes on a cliff overlooking the sea. 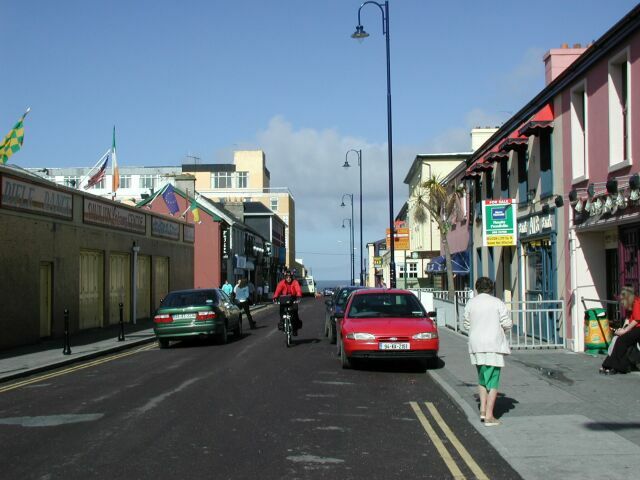 Finally, after fifty miles of biking on this long day, we reached Lahinch late in the afternoon. 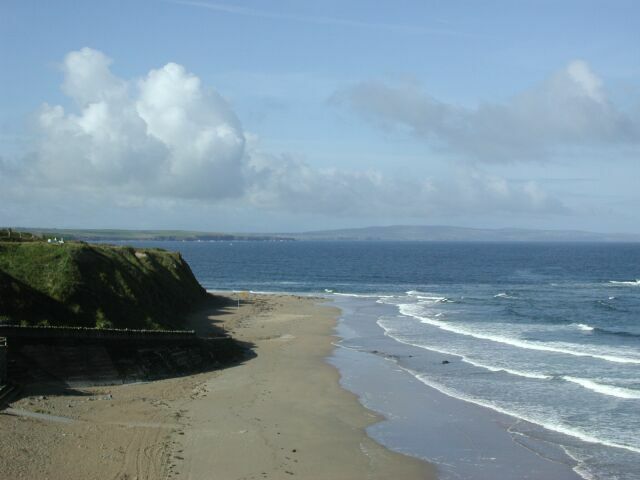 Lahinch had a beautiful setting on a rocky coast with sand beaches to the north and south. It reminded me very much of some movie set – in particular the one for The French Lieutenant’s Woman, which was filmed at Lime Regis in Dorset, England. I could just imagine the solitary woman in black, walking the rocky coast in the fog. Our hotel was in the middle of the one main street that paralleled the shore. A very pleasant young man greeted us at the hotel, and helped us lock up our bikes in a shed behind the hotel. As seemed to be the case everywhere, our rooms were just at the top of the stairs. My room overlooked the street, and as I sat on the bed I could hear the Irish music from the Celtic Sound Music Shop across the street drifting up and enveloping me. I munched on the last of my little red hot boxes and watched the day’s Tour de France on television. Len had his heart set on Irish stew for dinner. We had had stew at our lunch meal during the conference in Dublin, and he wanted another taste of it. We had looked at menus on previous evenings for stew, but we had never found it listed. Once again, as we walked up and down the main street we looked for stew on a menu. On this evening, Len seemed particularly set on finding it, but we returned to our hotel empty-handed, as it were. The friendly host at our hotel told Len that they served stew in the bar, but not in the hotel restaurant. However, just for us, we could eat in the restaurant and they would bring in Len’s stew. So that’s what we did, and while I ate duck, Len had his stew. My duck was better, though. I know this sounds monotonous, but after dinner we went in search of a pub with music. By now we were asking for folk music, not traditional, and we were told that the pub at the top end of the street had a very special night, called a jamboree, where singers would come from all around to take turns entertaining. We got there early and actually got to sit at a table near the stage, whereas we were used to standing everywhere else. Maybe this jamboree wasn’t so popular after all. Soon an old man asked if he could join us, and of course we agreed. His thick brogue was hard to understand, but after we got through the “we’re not here to play golf” thing, and we said that we had biked from Cork, he started telling us about how he was once the Irish cycling champion. Well, he amended that slightly. It seems that he had finished second to some younger man, who regularly commuted a hundred miles over mountains every day. But that younger man had died a few years ago, so the old gentleman figured that made him the reigning champion of cycling from that yesteryear. I wasn’t sure whether to believe him or not, but before we could go further with this tale, the music started. At first there was a two-man-band, which sang some lackluster American song to a mechanical, synthesized background. Is this it, I wondered? But it became apparent that the singer was merely the host of what was to follow, which was more like a glorified amateur hour. He introduced the next singer, who was a tall middle-aged man who had been drinking near us. This singer was quite good, singing an unfamiliar Irish song with a strong baritone voice to the accompaniment of a guitar. He sounded very professional, and I thought he could be an opera singer. I was sorry to see him leave the podium, and be replaced by an older woman, who got up from the table behind us. Was everyone in this pub a singer? I had visions of Len and I being called to the stage. The woman had brought her own cheering section. Perhaps it was her children, or maybe just friends, but they all urged her forward as she whispered to the guitar player about what she wanted to sing. I had low expectations, but again she was very good. She was past middle age, but she gyrated her body to the music and put on a radiant smile. It was really quite charming. After generous applause for her first number, she was urged to sing another, and she asked the host if he could join her in a duet to “The Streets of London.” The two of them conferred for a minute, and then began a wonderful spontaneous duet that was quite imaginative in the tradeoffs between the singers. I was enchanted. Now the host called up another nearby drinker, an older man. The old cycling champion sitting next to me nudged us and said that this man was really good. So now I had high expectations that were quickly dashed. He was bad. His notes were off key and his voice was shaky. This wasn’t at all charming, and I hoped we weren’t in store for any more of this sort of thing. Fortunately he was soon replaced with a young thin girl. The old man told us that she sang at some local pub, or perhaps it was our hotel. The waif-like girl with long black hair borrowed the host’s guitar and started tuning it up. She would do her own accompaniment. Presently she sat on a chair and sang Sting’s “Fields of Gold.” Her voice was a little thin and immature, but maybe I was getting too picky. Len was already getting bored, and I could feel the same ennui coming on. Restlessness was overtaking us; it was time to be going. However, going seemed to be a problem. Whereas the pub had seemed empty a short time before, now it was so packed it was impossible to fight our way out the door. Over the crowd we could hear the young girl singing, of all things, “American Pie,” as we were caught immobile in a crush of pint-wielding patrons. It sure didn’t seem like there were any tourists in this pub on this special night. Locals had come from all around to hear their friends perform. There was an authentic charm about the place. 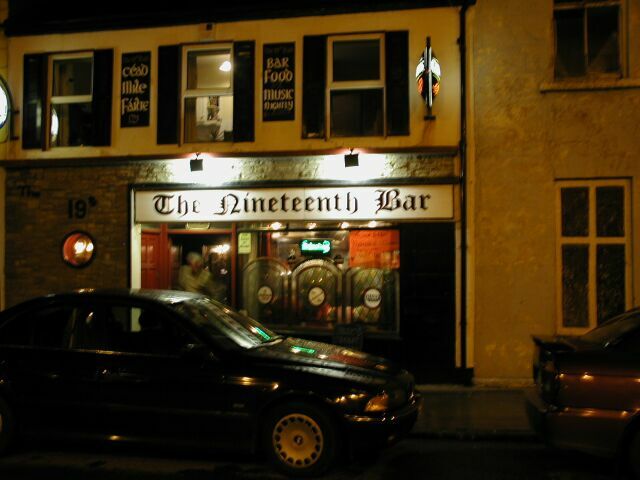 Down the street we had been recommended to try the pub “Nineteenth,” where we found a two-man band sitting at a regular table in the middle of the pub. Once again we heard the song “Black Velvet Band,” but the singer wasn’t very enthusiastic or talented. After that, the other band member started in on a harmonica solo, and I had had it. We walked down to the other end of the main street, where we found a modern, bland pub at the bottom of stairs from the sidewalk. It was full of young people. I said to Len that we were older than anyone there by at least thirty years. What a depressing thought that was! Here there was a full stage, and a large band, which at the moment was on break. By unspoken consent, we didn’t invest in a beer while we waited for the break to end. We knew that we would soon be gone, and when the rock music started, we left. Actually, the music wasn’t bad, but it was hardly Irish. We could have been in any young persons’ bar in the world. Back at the hotel at midnight, I studied the map for the morning’s journey. I dreaded what I saw. This time I did have the detailed map, and it painted a grim story. 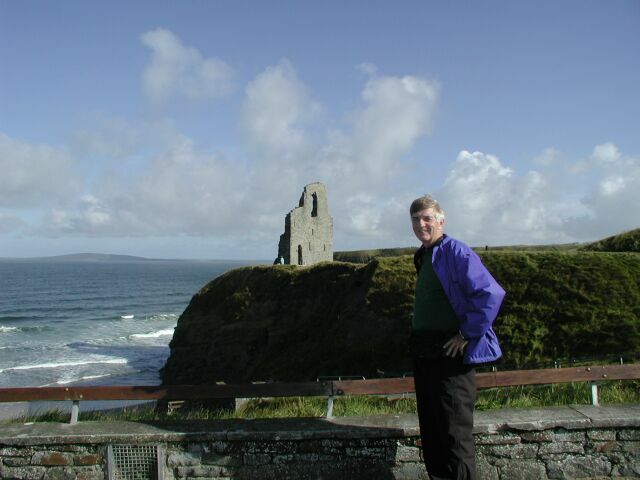 There was no way out of Lahinch to the north without climbing a long steep hill to the Cliffs of Moher. The road rose over 800 feet in vertical ascent in the space of a mile or so. Outside my window I heard loud crowd noises, and I lay sleepless for several hours. At exactly 2:00am the sounds suddenly ceased. The pubs had closed. I still tossed and turned.